Have you recently factory reset your iPhone and now wondering if you can get your WhatsApp chats back? Factory resetting iPhone is not a rare thing for iPhone users. iPhone needs to be restored to factory settings for many reasons such as improper jailbreak, failed iOS 12 update, system crash, and so on. We understand how important your WhatsApp is to you and how much vital things it contains. From texts to attachments to sometimes important documents are there and losing them is not at all affordable. We would like to tell you if you are able to recover your WhatsApp chats after formatting your iPhone and explain why. Through this article, we will also show you how to recover WhatsApp chats after factory reset. 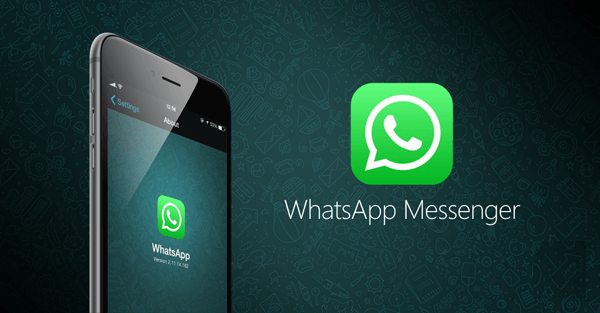 Can You Recover WhatsApp Chats After Factory Reset Directly from iPhone? Usually the deleted or lost data including WhatsApp chats on iPhone are recoverable. You can recover them on deletion if actions are taken immediately. However, if you have performed factory reset in your iPhone and formatted it, unfortunately the data that has been deleted becomes irrecoverable. 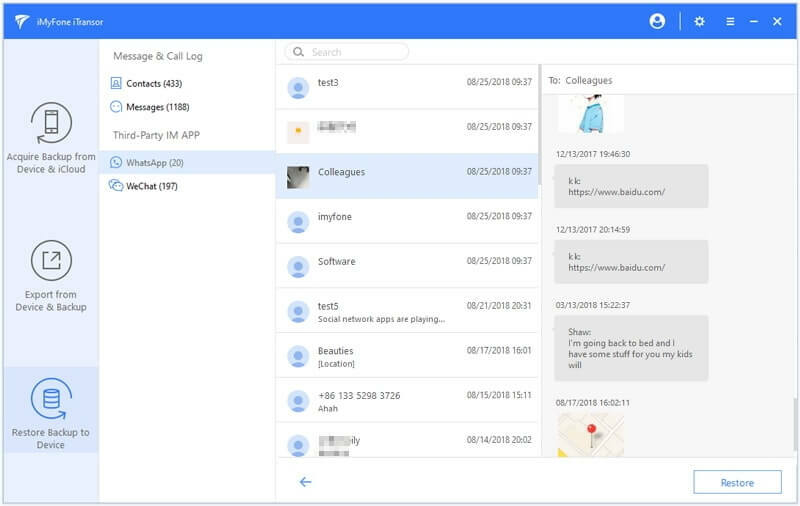 You should be aware that an iOS device utilizes SQLite database technology through which it makes the track of your data and saves their address in the device. When accidental deletion happens to your device, the data are not completely removed. The SQLite is changed to be "Unallocated" in order to free up the space for the new data. The accidentally lost data gets hidden in the device and can be recovered by third-party tool. However, there is a difference between accidental or normal deletion and deletion due to factory reset. The deletion due to factory reset will complete remove all the data and settings. Hence, it makes it hard and nearly impossible to recover WhatsApp chat after factory reset directly from iPhone. 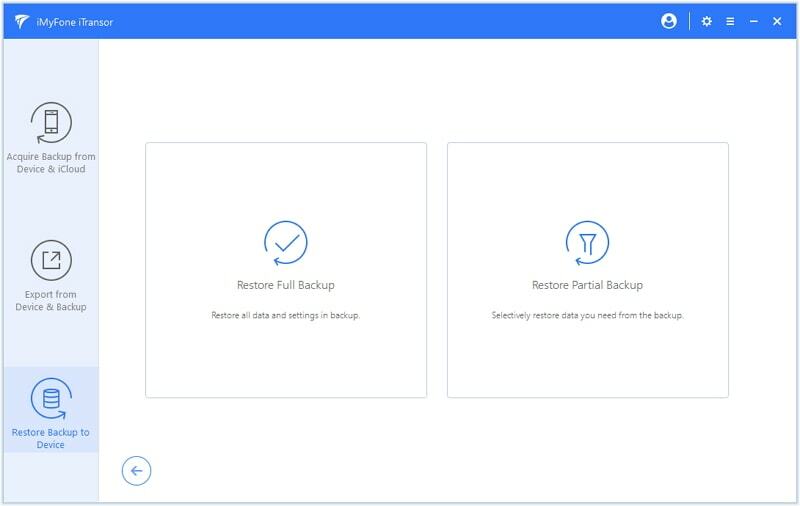 You can only recover the data when you have backup and we have given the tutorials for this in the following sections. When you are in need to recover your WhatsApp chats after factory resetting iPhone, we recommend you to use iMyFone iTransor. Before you use this tool, you have to make sure that you have backed up your WhatsApp using iTunes or iCloud before you factory reset your iPhone. 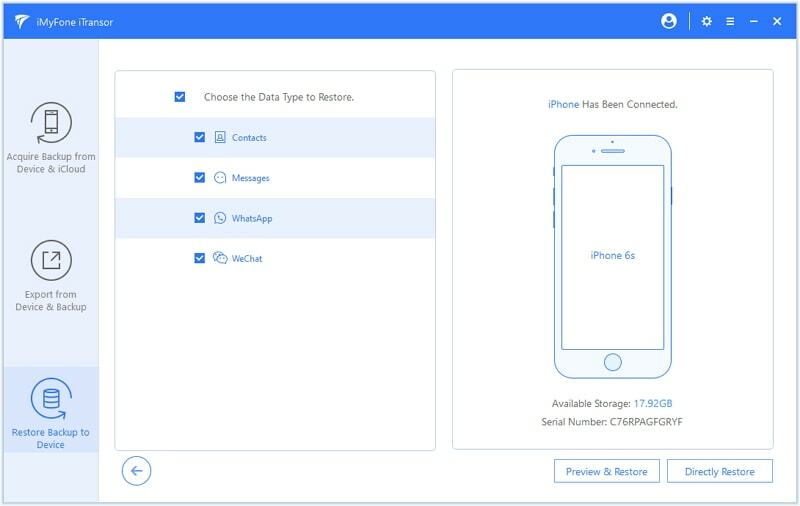 iMyFone iTransor is an iPhone data backup and restore tool which allows you to selectively backup the data on your iPhone or restore the data from iCloud/iTunes backup. 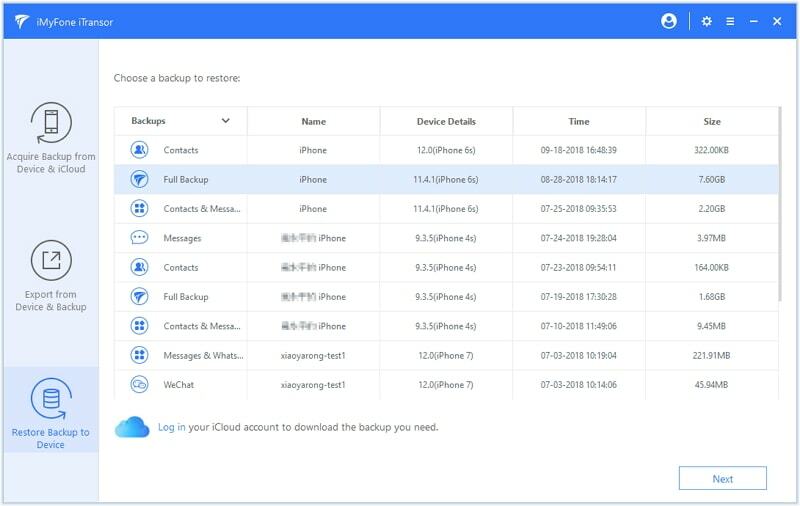 You can backup and restore only Messages, Contacts, WhatsApp, WeChat data instead of all the data. It will merge the WhatsApp data on your device with the WhatsApp data in your backup file without affecting the other data on your device, so it is the best tool when you want to recover WhatsApp chat from iCloud or iTunes backup after factory reset. Let us understand how it can be used to recover data from iTunes backup which we will take as an example. Step 1 –Download and install iMyFone iTransor on your computer. After this, launch the software and click on ‘Start’ button followed by ‘Restore Backup to Device’ from the left panel. Choose the iTunes backup that contains the deleted WhatsApp chats and click "Next". You will be offered with 2 options. Since you only need to recover WhatsApp chats, just click "Restore Partial Backup". Step 2 – From the data type list, choose WhatsApp, and then connect your iPhone with the computer. You can see the 2 options 'Preview & Restore' and 'Directly Restore'. If you want to confirm if the iTunes backup you chose includes the WhatsApp messages you lost after factory resetting or not, you can choose 'Preview & Restore'. After a short while, you can preview the WhatsApp conversations on the screen. Click "Restore" after preview. 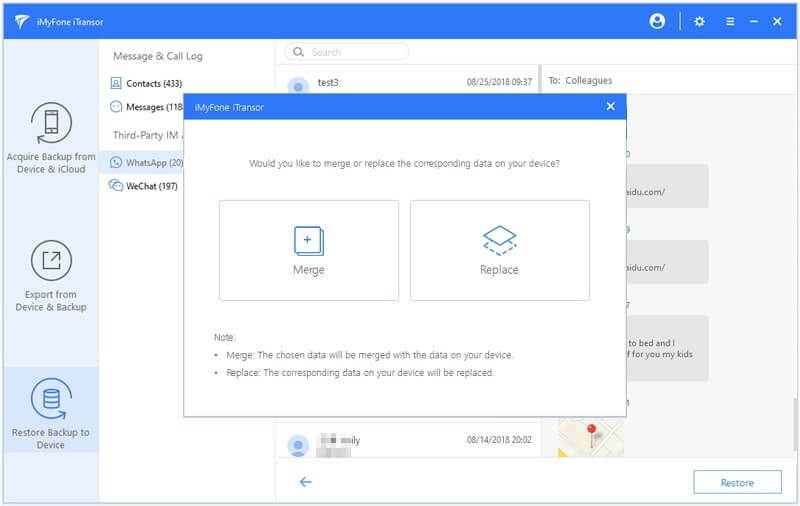 Step 3 – The last step is to choose from "Merge" and "Replace" options. If there is no new WhatsApp messages and you don't want to merge it with the new chats on your device, you can choose "Replace". Then after a while, the program will recover the lost WhatsApp data after factory resetting to your iPhone. If you want to recover WhatsApp chats after factory reset from iCloud backup, you can also use iTransor (supporting iOS 12) and the steps are similar. 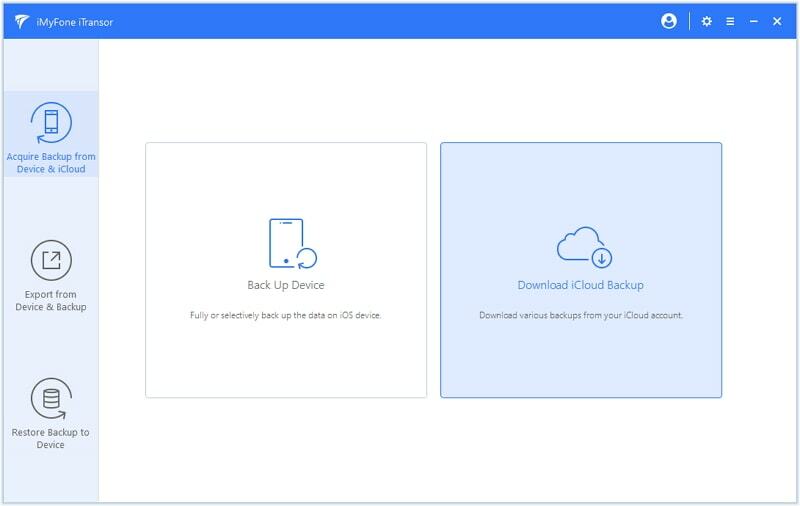 However, you need to download iCloud backup from your iCloud account from the tab "Acquire Backup from Device & iCloud", and then click "Download iCloud Backup". If you have backed up WhatsApp messages to iCloud from WhatsApp the app itself, you can follow the process of WhatsApp backup restoring to recover WhatsApp chats even after factory reset. Following is the guide to restore them. Install WhatsApp from App Store again and make sure to configure iPhone with same iCloud details as the old one that you used for backup. Now, after successful installation, enter your phone number to verify the login and you’ll get ‘Restore Chat History’ option. Tap on it and follow the onscreen instructions. Within a while, all your WhatsApp chats will be recovered. Where Did My Text Messages Go on iPhone?